Provide comfort for the family of Lou Ginn with a meaningful gesture of sympathy. Lou was born to AJ and Elmina Warren Cone on July 20, 1922 in Jacksonville, FL. She resided in Williston, FL during the depression before moving back to Jacksonville where she graduated from Lee High School. While in high school she said she was a really good dancer, especially the jitter-bug! She attended Florida Southern College, where she met her future husband Art Ginn, and she ultimately graduated from college at Florida State University, Tallahassee. She married Art in 1945, at the end of World War II when he returned home from his Naval Service. They were married for sixty-two years before Art’s death in 2007 and they resided in Palatka all of their married life. Lou was a long-term Brownie & Girl Scout leader in the 1950s and 1960s. 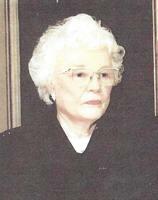 She was a member of toastmasters and many civic organizations in Palatka. Lou was among the first US residents to travel to China in the early seventies when travel between the two countries was first opened and made available to US citizens. She visited China three times, and many other countries as well, since she was an avid traveler. Lou was also a life-long bridge player and participated in several bridge clubs in Palatka for over fifty years. Her quick wit and sense of humor was well known to her bridge playing friends and all who knew her. Lou is survived by her son, Jay Ginn, and daughter-in-law Linda Ginn and their children, Bethany Ginn Restrepo and her husband Freddy Restrepo, Jayce Ginn and Chelsye Ginn. She is also survived by her daughter Judy Ginn and son-in-law Hunt Bowman and their children Ron Ginn and his wife Annie Beasley, Beau Ginn and his fiance Jessie Bailey, Stewart and Melissa Bowman, and Trevor Bowman and his wife Kat Howle. She is also survived by great-grandchildren William and Josie Bowman and many nieces and nephews. In lieu of flowers Lou requested donations made to National Public Radio (NPR). Checks can be made payable to WJCT, INC. and mailed to WJCT Public Broadcasting, 100 Festival Park Avenue, Jacksonville, FL 32202. Her memorial service will be Saturday, January 19 at 10:00 AM at Johnson-Overturf Funeral home in Palatka followed by a reception at Corky Bells Restaurant in East Palatka. Memories and condolences may be expressed to the family at Lou’s Book of Memories page at www.johnsonoverturffunerals.com . To send flowers in memory of Lou C. Ginn, please visit our Heartfelt Sympathies Store. Provide comfort for the family of Lou C. Ginn by sending flowers.